PETE SCHULTE is included in the publication portion of Yifat Gat’s ongoing “The Black & White Project.” Curation has become an important aspect of Schulte’s work. His co-project with artist Amy Pleasant, The Fuel and Lumber Company, put together a two-part exhibition and panel discussion in Birmingham presented in collaboration with UAB’s Department of Art and Art History in September that included our recent MFA graduate ASTRI SNODGRASS. Congratulations to our faculty who won awards in the 42nd Annual Bi-State Art Competition at Meridian Museum of Art juried by Brian Kelly, chair of the visual arts department at the University of Louisiana at Lafayette: a merit award to CHARLOTTE WEGRZYNOWSKI for her drawing, Cradle, and purchase awards to AMY PIRKLE, That Edge, and to BILL DOOLEY, Red Dogwood in the Pines. 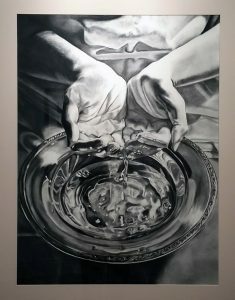 Along with a Merit Award at the Bi-State, Charlotte Wegrzynowski won the Howard & Michael Goodson and Richard Zoellner Purchase Award for her drawing, Font, at the 31st Annual West Alabama Juried Exhibition. In February 2015, MATT MITROS had a work juried into the III International Ceramic Triennial Unicum at the National Museum of Slovenia–Metelkova, where it was also purchased by the museum. He was recently a featured artist in Posit, a journal of literature and art. SARAH MARSHALL traveled to Cuba in October and brought back relief prints by Cuban artist and printmaker Aliosky García and others for the November exhibition, Entrelazado, in the Sella-Granata Art Gallery. Since 2006-2007, Marshall has made visits to Cuba with Book Arts professors and with Matt Mitros, developing collaborative relationships with fellow artists connected with the Instituto Superior de Arte, Universidad de las Artes, in Havana.